Held during the third full week of October each year, National School Bus Safety Week is an active and evolving public education program and an excellent way for parents, students, teachers, motorists, school bus operators, and school administrators to join forces and address the importance of school bus safety. College Place Public Schools Transportation Department is a critical part of getting kids to and from school safely each day. Bus drivers are the first and last person from CPPS a student sees each day and are an important part of a student's school day. These individuals work tirelessly not only to get kids to and from school but to also transport or sports teams all year as well as drive for the many field trips students take throughout the year. Each day CPPS transports over 900 students to and from school. This week we are celebrating the amazing job our bus drivers do to create a safe ride to and from school! 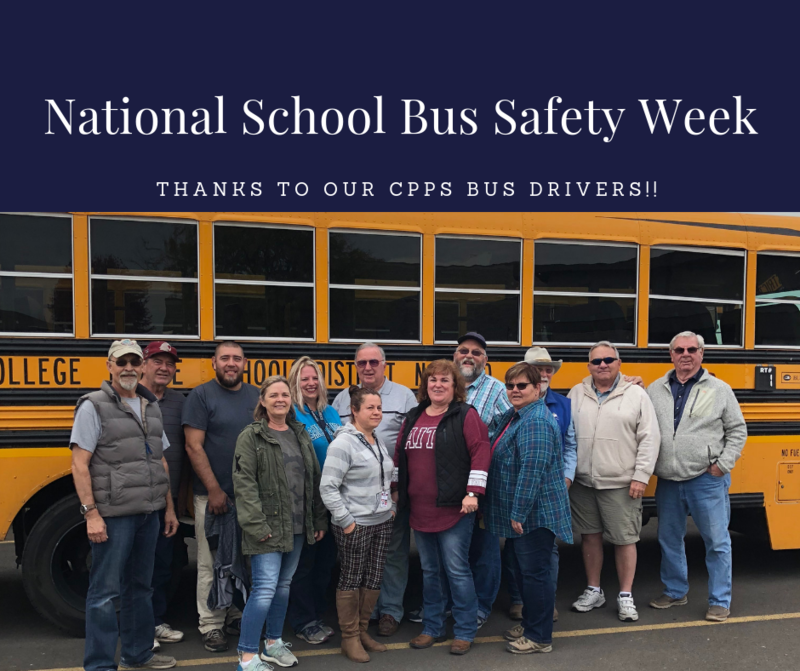 If you have a chance, thank a CPPS bus driver this week!